One of my favourite outfits I wore in Spain on my recent holiday was this one. I think the floral trousers are a real statement piece so all that was needed was a simple black vest and some statement jewellery. I'm loving the floral trend at the moment and as soon as I spotted these gorgeous trousers in Primark I just knew I had to have them! Best of all they were only £11...bargain! I think Primark has got some really lovely items in at the moment and I think the quality has improved compared to previous purchases. I wore this outfit for a meal out one evening - at first I thought the trousers may have been a little loud but it ended up being my favourite evening outfit of the holiday. I loved all the statement jewellery bargains I picked up from the local market - the necklace was only 2€ and the multicoloured bangles were 3€. I also picked up the cute little cross-body bag for 5€ from the same market and it's the perfect size to pop in my phone, money, keys and lipstick! What do you think? 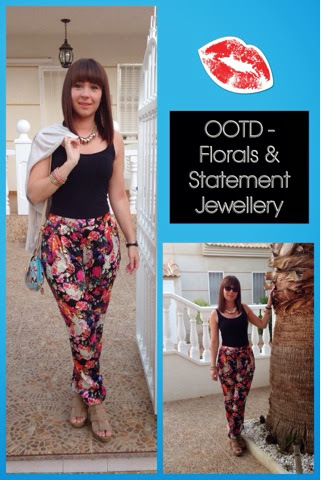 Have you been wearing floral pieces this season?